Description Scorpions are predatory arthropod animals of the order Scorpiones within the class Arachnida. They have eight legs and are easily recognized by the pair of grasping claws and the narrow, segmented tail, often carried in a characteristic forward curve over the back, ending with a venomous stinger. It is estimated that 2000 scorpion species from all over the world generate at least 150’000 different peptides in their venom glands (Possani et al., 2000, Cao et al., 2013 ). Diet They primarily feed on insects, and also arachnids, myriapods, gastropods and small vertebrates. Behaviour They are typically nocturnal animals, hiding in the day and foraging at night. Envenomation The severity of scorpion envenomation ranges from local pain and paresthesia to lethal cardiotoxicity and encephalopathy (Amitai, 1998 ). It is a serious cause of mortality in several Latin countries, in South America, southern and western Asia, and Africa. The number of scorpion stings exceeds 1.2 million per year worldwide, resulting in more than 3,200 deaths (Chippaux and Goyffon, 2008 ). Scorpion sting envenoming is an important public health problem in many parts of the world and is considered a neglected tropical disease by the World Health Organization. 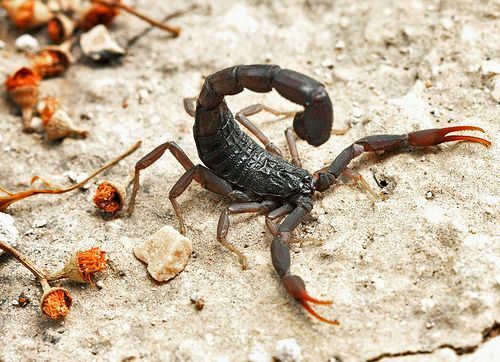 Miscellaneous An interesting particularity in scorpions is that they are resistant to their own venom due to the “sexual” stings and cannibalism occurring in many scorpion species (Andreotti and Sabatier, 2013 ). Scorpion tails are photosensitive, which could help detect the movement of prey under dim light. Interestingly, most scorpion species fluoresce under ultraviolet light (Cao et al., 2013 ). Other venom proteins that do not belong to the families cited above are regrouped in more than 15 families. These families are not described in a VenomZone page, but their names can be viewed in the “Protein by family” tab.